As the nefarious forces of darkness and unbelieverness wage their ubiquitous war on Christmas, it’s time we recognized a significant tragedy taking place every morning between Thanksgiving and New Years. While I realize just how seriously Christmas is suffering under the onslaught of the heathens and pagans of the world, I am gravely concerned over the unending collapse of the Christmas spirit I witness every morning. As Mr. Mom, one of my responsibilities to my family is to chauffeur my two children to school each morning they’re required by the State to be in attendance. Lately, as I diligently perform my daddly duty, I am reminded of the early morning sadness and the deflated feeling so many must experience as they encounter what were earlier bright, cheerful, and completely inflated characters – now languishing in flaccid, wilted sorrow on many a front lawn. 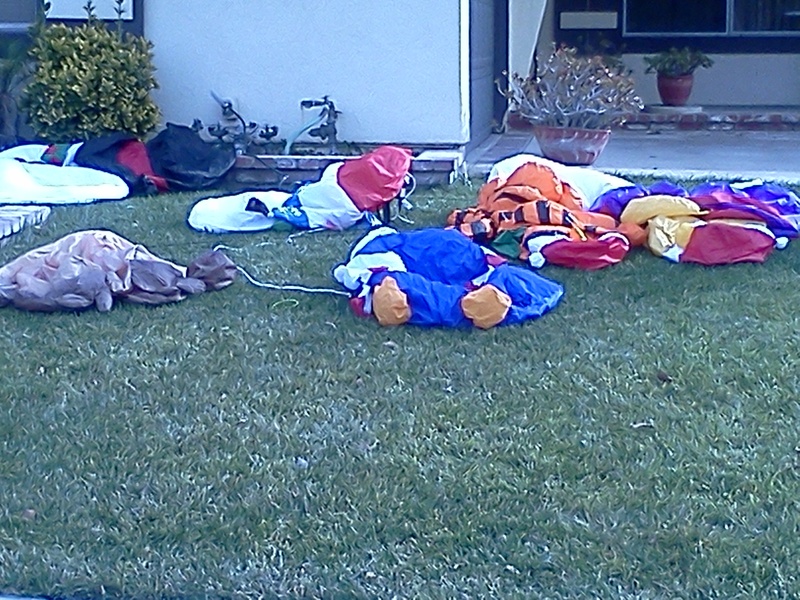 Santa, Frosty, Garfield, and Tigger – down for the count, or at least during daylight hours. It’s difficult for me to see these miserable characters, once so bright and bouncy, laying expended and useless on numerous lawns scattered throughout our neighborhood. Perhaps they could be enlisted for a spot with Pfizer or Lilly. Surely they must have a cure for this malady, though I’m pretty sure these things are erect each night for longer than four hours. This entry was posted on Friday, December 16th, 2011 at 12:43 pm	and tagged with Chirstmas, Cialis, decorations, flaccid, inflation, lawn, Viagra and posted in Personal, Random Thoughts. You can follow any responses to this entry through the RSS 2.0 feed. Haha, just this week I explained to a friend what those wilted, sorrowful piles were, and that they were waiting for nighttime to come alive. Hi Trisha – I find them kind of depressing, and now I’m looking for them everywhere I go, like the proverbial train wreck. Aaarrrgh!